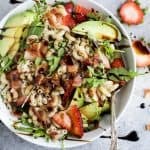 Easy Strawberry Avocado Pasta Salad tossed with fresh arugula, bacon, and a balsamic vinaigrette. The perfect summer salad or side dish to bring for all those backyard BBQ parties! In a small bowl, add balsamic vinegar, olive oil, dijon mustard, honey, dry basil, salt, and pepper to taste. Whisk until mixture to combined and the oil & vinegar no longer separate. Set aside. Add TruRoots pasta to boiling water. Stir and let it cook for 2-3 minutes or until your desired tenderness. Immediately remove from the pot, and drain. Add noodle to a large bowl and let cool for 2-3 minutes. To the noodle bowl add arugula, strawberries, bacon, and garlic powder. Using a spoon mix all the ingredients together. Add in the avocado and drizzle with balsamic dressing. Gently toss everything together so it’s all combined and serve!